The Ateneo Human Rights Center (AHRC) with the support of the Friedrich Naumann Foundation for Liberty (FNF) published a training manual for paralegals to contribute to the formation of more paralegals throughout the country, and eventually increase the access to justice of marginalized groups. “This training manual takes on the unique perspective of human rights advocacy and alternative lawyering. Alternative lawyering’s goal is not simple assistance, but lasting empowerment. It does not end with the close of a single case, but persists so long as inequality and unjust social structures exist,” said Atty. Carlos Medina, AHRC Executive Director. 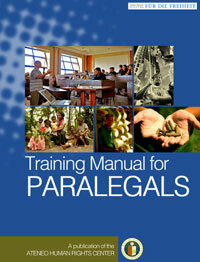 The manual explains what it entails to practice alternative lawyering, and engage in human rights advocacy work. The articles “Passion for Justice,” “Lawyering with the Poor,” and “Understanding Human Rights-Based Approach to Access to Justice” offer perspectives to understand what it is like to immerse in the situation of the marginalized, vulnerable, and underprivileged. The manual provides guidelines on interviewing clients, writing complaint-affidavits, drafting pleadings, and handling family relations and labor cases. Instructions on organizing training seminars, and conducting “popular education” are also presented. “With the publication of this Training Manual for Paralegals, we hope to engage more people in our work of educating the underprivileged of their rights and assisting them in their search for justice. We would like to see that human rights advocacy is not merely an alternative work, but the mainstream. We aim to create a ‘culture of human rights,’” wrote Mr. Jules Maaten, FNF Philippines Country Director in his Message of Support in the book. The manual was launched on 17 December 2010. To get a copy of the manual, please contact AHRC at +632 8917691 local 2109.